We’re now publishing the first section of answers by International Grandmaster Levon Aronian to the questions posed by chess fans as part of the “KC-Conference” project. This conference is the twelfth since the project began and the third with a truly international character: the questions came not only from the Russian KasparovChess forum, but also from readers of the English site Chess in Translation. The conference itself is also being published on our site in both Russian and English. In part 1 of the conference, the popular Armenian grandmaster replies in detail to questions on his outlook on chess, his career, his chess-playing colleagues and chess politics. He also gives some reflections on the Candidates Matches in Kazan. His replies are supplemented by Sergey Shipov’s now traditional short essay, a biography and selected games of our guest commented on by himself and analysts from our site. Levon has also been kind enough to provide us with photographs from his personal archive. Part 2, containing answers to questions on chess on the internet, chess books and journalism, the principles of preparation and improvement, openings, non-classical forms of chess, other games and also simply “on life”, will appear on our site in the near future. Discussion can be continued in Russian, in a thread on the KasparovChess forum, and in English at Chess in Translation. Levon Aronian (Levon Grigorievich Aronian) was born on 6 October 1982 in Yerevan. Since 2001 he’s lived in Germany, and he represents Armenia on the international stage. He became an International Master in 1996 and a Grandmaster in 2000. His current (and highest ever) Elo rating is 2808 (March and May 2011, third on the rating list). Levon was taught to play chess by his sister at the age of nine. His first major international success was winning the Boys U12 World Championship in 1994 (Szeged, Hungary), where the young Levon finished ahead of such future grandmasters as Bacrot, Ponomariov and Grischuk. In 1997 he won the “Kasparov Cup” – a prestigious junior tournament at the time, which was held in Moscow. He was the silver-medal winner at the 2001 U20 World Junior Championship and the adult Armenian Championship in 2001. In 2002 he won the Armenian Championship. In the same year Aronian won the U20 World Junior Championship in India – ahead of Ganguly, Timofeev, McShane, Bu Xiangzhi and Harikrishna. Levon Aronian has played in the European Championship a number of times. In 2003 he shared fourth place and in 2004 and 2005 he shared third place. He’s taken part in the World Championship in different formats. In the 2004 knockout championship in Tripoli, Levon went out in the third round (having beaten the 14-year-old Magnus Carlsen in the first). Levon achieved his first outstanding success by winning the knockout World Cup in December 2005 in Khanty-Mansiysk – beating Ruslan Ponomariov in the final match (in rapid chess in the tie-break). In the Candidates Matches that took place in Elista in June 2007 he beat Magnus Carlsen (in blitz in the tie-break) and then Alexei Shirov, thereby getting into the match-tournament for the World Championship in Mexico. However, in that event, which ended in victory for Vishy Anand, he didn’t perform well, taking 7th place. In the next cycle Levon won the right to take part in the Candidates Matches by finishing as the winner of the FIDE Grand Prix series of tournaments (2008-2010). In May 2011 in Kazan, Levon lost out to Alexander Grischuk in the quarterfinals (in rapid chess in the tie-break). He’s won or been a prize winner at a large number of international tournaments, with many of those at elite level. Among his most notable successes are: Reykjavik 2004 (=1), Gibraltar 2005 (1-3), Stepanakert 2005 (1), Linares 2006 (1), Moscow – Tal Memorial 2006 (1-3), Wijk aan Zee 2007 (1-3), Wijk aan Zee 2008 (1-2), Morelia – Linares 2008 (=3), Wijk ann Zee 2009 (2-4), Sochi – FIDE Grand Prix 2008 (1), Nalchik – FIDE Grand Prix 2009 (1), Jermuk – FIDE Grand Prix 2009 (2-3), Bilbao – Grand Slam 2009 (1), Linares 2010 (3), Moscow – Tal Memorial 2010 (1-2), Wijk aan Zee 2011 (3-4). Aronian plays well in team competitions. Back in 1999 he was in the Armenian team which won the European Team Championship in Batumi. The Armenian team, with Levon on first board, won the World Chess Olympiads in Turin in 2006 and Dresden in 2008. At the 2010 Olympiad in Khanty-Mansiysk, Levon posted the second best result on the first board, but the Armenian team finished only seventh. Levon Aronian has also achieved great success in non-classical forms of chess. He’s a three-time winner of the Amber Tournament in rapid and blindfold chess (2008, 2009, 2011), the Rapid Chess World Champion for 2009, a two-time Chess960 World Champion (in 2006 he won a match against Peter Svidler, and in 2007 against Vishy Anand). He’s the Blitz World Champion (Moscow, 2010). He’s an Honoured Master of Sport of Armenia and has been awarded the Movses Khorenatsi medal and a medal “For Service to the Fatherland” of the First Degree. Levon Aronian is a diabolically talented lazy guy. He’s been given far more than others, and he skillfully exploits that inequality of possibilities by putting in no more effort than required. At times Levon’s play is simple, like everything of genius. When you look at his games you get the feeling that you could do the same yourself. But for some reason it works out for him 9 times out of 10, while for your fellow man even the one remaining game ends up cumbersome. Aronian is favoured by the Gods. He gets lucky regularly and by definition. His victories are as natural as defeats are for the majority of us. The ease with which Levon wins games and tournaments is a delight. But it does him harm. The Armenian grandmaster has got used to acting easily and spontaneously, but the higher you climb the steeper the slope gets. In order to conquer the world’s highest summit he needs to work harder. For example, in the opening. At home. The habit of narrowing the scope of his work – by playing his favourite openings and almost never varying his repertoire – is a practical approach, but it won’t allow Aronian to realise his full potential. I’m sure that Levon’s also capable of playing at the necessary level – in the region of 2800 – in other openings, and in other typical positions. He only needs to want to and then to master it. What for others takes long years of painstaking work Levon, I’m sure, could polish off in a couple of months. And then you can confidently bet on him in a future World Championship match where, as we know, it’s very important to be unpredictable in the opening and able to compete on any territory and in any style. So those are the spots on the sun. Aronian really is a radiant person. It’s a pleasure to talk to him, and he doesn’t exude negativity, as many of his colleagues do. A sunny boy – that was what they called him in his youth. Having become a man, Levon has maintained that glow and positivity. - Why do people play chess? For pleasure, peace of mind and the moral torture of their neighbour. - Do you think chess is exhaustible? When you come up against computer evaluations like + 0.00 it’s hard to remain an optimist. - What is modern chess ultimately – sport, science, art or something else? It seems to me that an activity where your physical form doesn’t decide anything can’t, by definition, be a sport. The good thing about chess is that it has its own particular place. Krain: Why do you play chess, apart from the financial side? What attracts you to it? I like the life of a chess player: travelling, training camps, tournaments. But it also has to be noted that although I’m not a chess fanatic, I’m nevertheless far from indifferent to the game and working on chess. Aksenoff: Good day, Levon! I’m truly glad to be able to ask you these questions! Thank you and good luck in all you do! - In the starting position the shortest way Black can give mate is a move quicker than for White (two moves compared to three). Is that a curiosity or another proof of how drawn the starting position is? I like both of your versions. Perhaps that fact also tells us that – as in life! – it’s easier to destroy than create? Nvm: What, in your opinion, is chess ability? It strikes me there are a lot of pure chess talents, but many can also be trained. In my view, a certain sense of harmony exists in chess, and it’s common to call that talent. Sometimes you meet players from the most exotic countries, where chess isn’t popular, and those ladies and gentlemen stun you with the soundness of their play. vasa: How do you rate the intellectual level of modern chess professionals? Is it true that chess develops the intellect? The majority of my colleagues are wonderful to talk to and, in general, intelligent people with strong characters. It’s possible chess develops the intellect, though I’m not entirely convinced, but it definitely does develop analytical skills. Валентин: Nowadays computers are completely destroying the creative potential of chess players – would you agree that’s the case? That’s partially true, but I think there’s still enough creative potential for another ten to twenty years. After that the game will probably evolve. mishanp: Hi Levon, in one of Ilya Odessky’s reports from last year’s Tal Memorial he quoted Genna Sosonko as saying that the majority of the participants had heads so clouded by dealing with computers that it worked against them during games when they had to think for themselves. Odessky suggests, however, that you stand out as a player who’s found the right balance between working with computers and being ready to actually play chess. It seems to me that each top-level player has their own approach to the game, which is absolutely different to the methods of other players. Of course, you can’t get by without computers, and long hours spent in front of a monitor. The fact that people I respect think that about me is very pleasant, but it’s probably more of a sign that I’ve still got a lot to learn about chess. I’m striving to improve my understanding of chess while preserving my ability to find good ideas directly at the chessboard. In some games and even tournaments I’ve managed to do that, and as long as that’s the case I think those words commending me have a right to exist. John Tobish: I would like to congratulate you on your ascent to the highest echelons of the sport. The fact that each chess player has such a store of knowledge available can’t help but influence play. We very often play moves based on knowledge acquired with the help of databases, and some players (myself included) are even haunted by the thought that the majority of situations on the board are already familiar to us. It seems to me the majority of players don’t stop to think about all those mental tools individually, but instead perceive the use of them as part of a single operation. The difficulty in most cases lies in calculation and the ability to see the whole picture, particularly if the player has a jungle of variations available to him. The recall of typical techniques happens so imperceptibly that sometimes we even have the impression that we’ve invented them ourselves. I’ve seen a lot of beautiful moves, but it strikes me as impossible to single any of them out. Each time I arrive at a tournament I tell myself that it’s entirely possible that this will be the tournament where I manage to play a good game, and that’s a big stimulus. - If the wonderful Grandmaster Aronian becomes World Champion tomorrow will he feel any moral obligations beyond the chessboard (promoting chess, influencing FIDE politics, developing children’s chess, and so on) or will he prefer to be “the same guy, only with the title”? If that happens then I’ll probably try to combine taking part in tournaments and matches with work for the good of chess, but I think my main priority will still remain the game itself. - What act will the World Champion Levon Aronian commit without fail that he can’t just now, given his current status? Thank you. He’ll demand that tournament organisers provide a separate room for his beloved cat Pacquiao. - When did you realise that chess was your destiny? While I was still an adolescent I realised I had a talent for chess, and given that I didn’t shine in other spheres it wasn’t hard to grasp that chess was for me. So you can say when I was about 15-16 years old. - Have you ever felt during a game that you were a chess genius? I’ve felt that very often, but sadly in the majority of cases it was a false alarm. - I’d like to know what the most important and defining moments in your chess career were. Good luck in the coming battles! Probably the most important moment was my victory in the World Junior Championship in Goa. After I moved to Germany at the end of 2001 I needed tournament invitations to grow as a chess player, and having that title was a great help. - Which combination gave you the most satisfaction? It’s hard to recall a lot, but if I had to choose among what’s happened recently, then it would be the double exchange sacrifice in a rapid game against Boris Gelfand in Leon 2010. - The most dramatic combination? - The best novelty thought up and refuted? I’ve refuted other people’s novelties, but as they were of doubtful quality I won’t mention them, while I can tell you about the best novelty. That was the move 9. Qa4 in the English Opening after the moves 1.c4 c5 2. Nf3 Nf6 3. Nc3 e6 4. d4 cd4 5.Nd4 Nc6 6. g3 Qb6 7. Ndb5 Ne5 8.Bf4 Nfg4. That was the idea of my friend Gabriel Sargissian, who found and analysed it in 2007, but which I just couldn’t believe in. I was ripe for it (or saw the light?) in the game against Leko at Linares 2008. What comes to mind is the game I played as White against Anand in Linares 2007. I’ve had interesting endgames I could mention in my career, but it’s difficult to choose any particular endgame as the best. Among those I’ve played recently I might give the game against Jakovenko at the last World Chess Olympiad in 2010. - The most beautiful combination? I like the combination (but not the game!) against Popov in the Aeroflot Open 2005. It appeared in many databases with a serious error. On the 22nd move Black of course took on f5 with the pawn, and I took back with mine. The combination beginning with the move 27. Be7 may not be difficult, but it’s dramatic. - The best positional game? Perhaps not the best, but a good one from recent games was against Kamsky in Wijk aan Zee 2009. - The most difficult calculation? I can’t answer that question as the calculation in many games where everything appears to be calm can actually be much more complex than in sharp positions. - Your best intuitive decision? I’ll again mention a game I played in recent years. I really like the idea beginning with the move 22…f5 in the game against Akopian in Jermuk 2009, and the main thing is that, despite the apparent danger and the impossibility of calculating all the consequences – it’s absolutely correct. Mustitz: Which is the most “crooked” variation (in your opinion) that you’ve used in a serious game? I’m extremely strict in the opening. The most I allow myself is 1.d4 Nf5 2.c4 c5 3.d5 e5, and that’s only once in a blue moon. - Could you say something about your most memorable win/most upsetting loss! The most memorable win was against Bacrot at the World Cup in 2005. We met in the semifinals and after terrible play by both sides we got a drawn ending with opposite-coloured bishops, which we both considered completely won for me. Before the final move my pen stopped working, and after getting a replacement from the arbiter I still couldn’t write down my move as I was in ecstasy because I was winning and was going to qualify for the final. At that point Etienne (having played 50…Ba7) resigned and left. A couple of hours later both of us realised that we’d missed a simple idea in the position which would have brought the game to a draw. The most upsetting loss was my game against Van Wely in Wijk aan Zee in 2006. In a position that was winning before the 25th move, I missed an elementary idea. Given that it was the only one in the position and that instead of the blunder 25. Rf1 there were 4 moves that won, I only managed to get to sleep at six in the morning after comfort-watching “Det sjunde inseflet” (“The Seventh Seal”) by Ingmar Bergman. I’ll respond using too many words, but please bear in mind the mitigating circumstance that I’ve got a maniacal affection for jazz. Given that Thelonius had fame and recognition only among his colleagues, while the critics had difficulty understanding his ideas, he’s probably better reflected in the chess world by Michael Adams, while Magnus himself is more likely Tony Williams – a prodigy and trendsetter. It’s a difficult task for me to compare myself to anyone. My natural modesty means it’s hard for me to name Joe Henderson or Booker Little. So as not to disappoint you, I’ll give a short list of other comparisons. Let’s start with one close to my heart. Vassily Ivanchuk, in my opinion, is Ornette Coleman – that same universality and great influence on other players. Bent Larsen is somehow similar to Roland Kirk. A great melodist (positional player), whose play was extravagant. Vasily Smyslov could very well be represented by Grant Green. A harmonious manner of play and wonderful technique. I associate Tigran Petrosian with Warne Marsh. A unique style of play which, it seemed, was too calm and dull, while in reality it was deep and cunning. Games are more songs, while albums are tournaments, and I’m sure that every strong player has had individual games that have gone smoothly. But tournaments… You rarely play a whole tournament without a bad game. Out of the tournaments where I managed to demonstrate decent play in a majority of games I rate one of my early successes the highest – the European Championship in Warsaw in 2005. Гость форума: Hello, Levon! Thank you for taking part in the KC-Conference! - Out of the whole world top-10 you have the lowest draw percentage in the games you’ve played (according to my database). How can you explain such bloodthirstiness? So I’ve been found out. Yes, that’s how I am, and there’s nothing that can be done about it. It’s hard to explain, but I’ll give it a go. I think the thing here is my diet. For 11 years now I haven’t eaten any mammals – although it’s well-known that I’m a person with a bloodthirsty nature. So then, sitting down to play a game and, metaphorically speaking, meeting an animal face-to-face, I experience nostalgia and try to get my fill of blood in those short moments. Nvm: How would you allocate the role of the following factors in your achieving such a high level? ---1) Ability 2) Good coaches 3) Personal desire and hard work. In terms of percentage – for example, “60-10-30”. 50 – 20 – 30. Superstoned: Greetings, Levon!! You are one of my favourite chess players today and I would love to see you become World Champion. Thank you for taking the time to answer your fans’ questions! It strikes me that you’re forgetting the factor of help from family and friends in achieving a goal. As a talented player I always had a great talent for being lazy as well. If it wasn’t for my family (and particularly my mother) and my friends, who did the majority of the work for me, then it’s unlikely I’d have been able to achieve success. bgo: Haven’t you got bored of playing a game in which you almost never lose? Whenever it’s getting boring my caring rivals come to offer assistance. Armenia: Hello, Levon! Greetings from Ashtarak (Armenia). I’m a great fan of yours. Thank you for your attention and we believe you can become the second Armenian World Champion. - Recently you practically never lose. When Tigran Petrosian became World Champion he was also losing rarely. Does that mean you’re following in the Champion’s footsteps? - You always play very quickly, even if you’ve got lots of time. That’s sometimes worrying – what if you suddenly make a mistake? I’d like to know if that’s normal for you? I try to play quickly as that gives my opponents the idea that I’m very bold and unafraid of blundering. There’s also a second reason. My family and friends follow my games and, knowing that I usually calculate variations quickly, they get nervous when I think for a long time. So it’s all so the team doesn’t worry. - Don’t you think that on your creative path you lack “fighting spirit”, as after all it’s impossible to conquer the world summit without that component? Or perhaps we’re wrong – I’d like to hear your opinion. Thank you, respectfully. Arsen and friends. I assure you I’ve got more than enough fighting spirit. Without that component I think it would be difficult to win in final rounds, but I’ve managed it on dozens of occasions. The fact that beyond the game I’m benevolent to my opponents disguises that. - Your style of play reminds me of Bronstein’s. How would you define your style yourself? For me it sometimes resembles the styles of Korchnoi, Spassky, Gligoric, Larsen and Ivanchuk. As you can see, I haven’t determined it yet myself. I could have added a couple of names to that list, but I decided to retain at least some sort of secret. - Which chess player’s games had the greatest influence on you? I was strongly influenced by Alekhine’s games, as a collection of his commentated games was one of my first chess books. calvin amari: Levon, somehow I get the impression that you can follow someone into a revolving door yet somehow manage to emerge ahead of them. When you are in good form, as you plainly were at Wijk aan Zee, it seems that you have an uncanny ability to set trap after nasty trap for your opponents. Even if only a small percentage of these tricks work against the world elite, you set so many that they often ultimately make the key difference in your games. It’s good to learn that in my play people see such varied techniques that I’ve never noticed myself. Is tricky play my style? If that was true, then I don’t think I’d ever have had the opportunity to tell people about it. The majority of players at the top level use the tactical motifs you call tricks in their play, but I’m sure that in the overwhelming percentage of cases it isn’t done to the detriment of their position. As often as I did in my childhood – only in the inverse proportion. It’s difficult to call that an approach, as against an attentive opponent it’s always doomed to failure. If you’re going to use such ideas when playing against an experienced player then I recommend you wear a colourful outfit and learn to juggle, so as to distract your opponent from your moves. Jerboa: Levon Grigorievich, now that chess has become your job do you still find it as interesting to play as you did 15 years ago? Do you regret the path you chose? As I’ve fulfilled many of my dreams with the help of chess I’ve got no cause for regret. The most interesting thing is the path to improvement. Aksenoff: You’ve beaten everyone in the current elite. But were there cases in the last 5 years of losing to players who were much less qualified than you? In simuls/blitz/handicap? Do losses to Van Wely count? But seriously, I regularly lose on the internet playing blitz against players with a 2100-2200 rating, which provokes genuine compassion among my friends who are watching it happen. The fact that I was late to cross the 2700-barrier can be explained by the fact that living in Armenia I didn’t have the necessary opportunities for progress, as back then flights to Europe were very expensive, and it was rare at the end of the millennium for young chess players to receive help (in the mid-90s it was incomparably better when it came to sponsorship). If I’d grown up just now then of course I wouldn’t have had such problems, and in fact it might have been the opposite, as it would make sense to move to Armenia in order to develop as a chess player. But after moving to Germany at the end of 2001 I got the opportunity to play in European tournaments, and as a result I was finally able to get down to playing and discovering my potential. There’s no point explaining why I crossed 2800 yet as I’m still not established there, and I still haven’t completely proved to myself that I’ve got the right to have such numbers. Changes in play, preparation and my approach take place for me independently of Elo or the quality of my play. I like to introduce new ideas into my play and I regularly revamp the list of people I work with. I had the most difficulty with the 2600-mark. For various reasons I didn’t manage to cross it quickly, but the moment that happened the next 100 points passed in a flash. I was helped in crossing the 2600-mark by regularly playing in the German Chess League. With the help of Arshak Petrosian, who organised my meeting with the management of the Wattenscheid team, and Ulrich Wolf, who believed in me immediately, I settled down to play for that wonderful club, where I met strong players on board one and cut my teeth in those encounters. Thank you for believing in me. I think it’s a very tough mission, but who knows, perhaps in the next 5-10 years we’ll see figures even higher than that? True, if what you’re looking at is the gap to the other players in the top ten, then I don’t think it’ll be possible to break the records of Fischer and Kasparov. Computers have improved the general mass of players so much in recent years that breaking away from the chasing pack to such a degree seems barely realistic. - Does taking part in tournaments interfere with your preparation for the match struggle in Kazan? Taking part in tournaments is an essential part of preparation. Playing habits are usually more important than deep knowledge, and more so as we’re talking about short matches. - If you win a game and then in home analysis it turns out that all the moves were played according to Rybka’s first line, is that some sort of additional compliment for you? That depends on the depth at which it’s the first line. In the majority of cases the computer doesn’t blunder tactics, so if the game was complicated then of course it’s a compliment. - Do you see yourself as a future World Champion? I don’t rule out the possibility, but it’s also not something I think about too much. Zeppa: Your numerous fans are truly hoping that you’ll become World Champion someday. - Do you have that ambition and do you promise to do everything necessary to achieve that goal? I’ve got the goal of improving the quality of my play and achieving victories thanks to that. I promise to try my hardest to achieve that goal. Will that lead to winning any titles? That’s a question I’d be interested in seeing the answer to myself. - I’ve got the feeling this is your cycle, but what do you think? I hope this cycle won’t be as much of a disappointment for me as the last. I won’t risk calling it “mine”, but I hope the systematic work done in recent months will have a positive result. This cycle is very interesting, as very strong players are taking part and each of us has approximately equal chances of success. Preparation is taking place in a leisurely manner and we’re trying to spend more time on physical training. - Can you comment on the widespread opinion that you don’t spend enough time studying chess? The thing is, that claim used to be true, but in the last two or three years I’ve become more responsible in my approach to my favourite occupation, and started to study chess regularly. - Should chess fans’ idols, like you, share your “secret knowledge”? Are you planning on working on a book? It seems to me that by writing a chess book an elite chess player helps fans to understand his games and encourages the appearance of players imitating his style of play. That can’t but delight the authors of games and books. For that reason I’m planning on writing a book about chess – whenever I have enough time for that time-consuming work. Ilik: Levon Grigorievich! You know the opinion of Sergey Shipov (I hope you respect him! ), and probably not him alone – that you’re a “diabolically talented lazy guy”. - Aren’t you offended by that? You probably work a lot, including on the openings, but something like that’s said about you (good-naturedly, of course)! On the contrary, it’s nice to hear something like that. It’s definitely better than “a diabolically hard-working mediocre guy”. - When saying that Sergey believes, of course, that you can still get better. But are you really sure that you can; what do you think? It’s not hard to see that it’s possible to play better than I do just now. In recent years I’ve been simultaneously trying to get rid of a production flaw while preserving a light and optimistic style of play. I’m very satisfied with some of the games I’ve played in the last two or three years. - If you’re the Chess960 World Champion that means you have a great feel for non-standard positions. And at the same time your opening repertoire isn’t that rich (in any case, according to Sergey). The question is – why? After all (in my amateur opinion) it should work in your favour to force your opponent to play at the board, and not at home. Your opinion would be true if we had reliable information that all the representatives of the modern chess elite play Chess960 badly. But the majority of elite players haven’t taken part in Chess960 tournaments, so it’s not entirely clear. I’m busy extending my repertoire, but that’s usually a very slow process, as for me it’s more important to do repair work than to build something new. It’s quite probable that Alexander and I have some similar playing techniques. We both like to get positions where there’s dynamic tension. In chess I’d like to improve my memory, and in life it wouldn’t be bad to be more attentive. Zeppa: Do you see yourself in the role of a coach (or at least a consultant) after ending your career as an active chess player? After ending my career I’ll probably allow myself to take a year off and then I’ll try to work out what I should do next. Being a trainer or a consultant would of course be interesting, but I doubt I’d like to spend my whole life on a painstaking analysis of opening nuances. - When chess variations are spinning around in your head what kind of board do you picture – 2D or 3D? You know, I never thought about that. Mine’s in 2D, but is it the same for everyone? - Do you consider your performance at the Wijk aan Zee 2011 super tournament to have been a success? Given that as well as sporting aims I also had aims as a chess intelligence agent, I’m satisfied. - Do you think the fact Grischuk apparently performed so badly in Wijk was a psychological ploy before your match? I’m sure this is your cycle, so I wish you victory and winning the Chess Crown. Of course, there can be tricks before a match, particularly from a strong player, but nevertheless I think Sasha simply had a very poor tournament. It’s rare for the game itself to irritate you. It’s usually your moves that disgust you, particularly when you spoil a position with a reckless move. If there comes a point when chess irritates me, which is, of course, unlikely, I hope I won’t be obliged to keep playing it. Of course! I get the most pleasure after a slight pause between tournaments. Then I find myself in the mood for playing, and immediately start to think about how I need to play this time so as not to commit the same mistakes as before, how to try and surprise my opponents, and so on. Tournament games are the most interesting, as in that case each opponent plays at full strength, and the games end up being more fighting and nerve-wracking, turning them into a spectacle. vasa: Have you ever wanted to give up chess? It sometimes happened in the past that I’d have such thoughts for a couple of minutes, and it seemed to me that if I wanted to I could become someone else, but simply the thought of studying long and hard for other professions brought me back down to chess earth. phisey: Levon, how do you see your chess old age? Will you play to your final breath, like Korchnoi (God grant him health), or are you intending to switch to other forms of activity? If I have the same passion for the struggle, then why not? At the present moment I don’t see myself playing chess when I’m a senior. Zeppa: How would you define genius in chess, and which chess players do you consider geniuses? It strikes me that genius is much easier to see in a person than to somehow define. I consider the majority of World Champions to have been geniuses. Among the players who didn’t reach that height there’s also been no lack of geniuses. For example, you can call Nimzowitsch a genius – for his contribution to the understanding of the game. Among contemporary players Ivanchuk stands out – for his chess multifacetedness. A chess player is great if he dominates and brings something new to the game. The ability to handle defeats stoically, the ability to control your emotions, and a killer instinct. Nvm: Do you have a chess idol? There are chess players whose play I really like. It’s often the case that new faces are added to that list. I can’t call them idols, as I treat them as equals. - Do you think it’s possible that a chess player could be born who’s really head and shoulders above the other players (let’s say, with an Elo of around 3000), or is 2800+ the limit for the capabilities of the human brain? Even if we assume that such a chess player has appeared or will appear, he still won’t be able to fully show his potential. Advanced opening theory reduces the importance of talent in the game. I always considered that person to be yours truly, but seeing as I’ve started to study recently it’s hard to point to anyone. Devotion to chess and a self-sacrificing capacity for work bring to mind Kramnik, but the first part of your statement isn’t about him at all. There are a couple of people I could mention, but I won’t do so as I don’t want to provoke them. You can choose any player who’s been at the forefront for the last 5 years. It’s hard to single anyone out, as the majority of elite players have flawless technique. moroshir: Did you study the games of Paul Morphy, Mikhail Chigorin and Rashid Nezhmetdinov? Thanks to my parents, who believed in my chess talent, I had quite a decent library. The games by the old masters appealed to me. I especially liked analysing the Chigorin – Tarrasch match, and in particular the games where there was a struggle with a closed centre. Igor Egin: What, in your view, would be the outcome of the games Paul Morphy – Vladimir Kramnik and Vladimir Kramnik – Paul Morphy? How would they go? Oton: Hello from Bulgaria, Levon Grigorievich! I’d like to pose you a few questions. - At what Elo-rating, in your opinion, would Morphy, Steinitz and Chigorin play just now? If they brushed up on theory, then at 2700 – 2750. - Which World Champion’s style of play is closest to your own? - Which World Champion’s games do you consider closest to your own? In terms of the character of play some of my games are similar to Spassky’s. - Which of the great dead players would you like to play? I don’t have such fantasies, but if I had to choose, then blitz with Tal, Petrosian or Stein. - How do you feel about Capablanca, Alekhine and Fischer? I’ve got huge respect for all great people. - Was Fischer a genius or did he simply study chess a great deal? If Fischer was still here now would he play in the 2700+ elite? Fischer, in my opinion, is the greatest player ever to have sat down at a chessboard. The fact that besides his achievements at the board he also managed to invent his own clock and chess is further confirmation of that. I don’t think Fischer would have played chess after 60 like Korchnoi. In order to do that you need to be unafraid of losses and new tournaments and, as we know, Fischer was often uncomfortable before tournaments. vasa: How would a blitz match finish between the current Levon Aronian and Jose Raul Capablanca (or Alexander Alekhine) in his best form? Please be frank and honest. Given the reality is that although I’m not a bad blitz player I’m far from the strongest, I think Capablanca and Alekhine might be able to upset me on occasion. bgo: What do you think – if a match took place between Capablanca (with the baggage of knowledge of his time!) and a contemporary 2500-player, who would win? And what about a 2600-player? I don’t think a 2500-player would pose Capablanca any problems. As for 2600, it depends what sort of 2600-player. An experienced player could give him problems. Ilik: Capablanca was also once considered a lucky guy, and he was so convinced of his own strength that he even predicted the draw death of chess (saying that if you want you can always hold a draw). Modern chess players are unlikely to seriously think that! But then Capablanca came up against the young Alekhine, and things were no longer so simple! - Could you predict who’ll be able to become the next chess king? Thank you for your reply, if you get round to it…! In the current age, when the chess elite is continually being supplemented by new players, it’s hard to answer that question. It’s easier to wait and see. - If Kasparov returned to serious chess now, having worked well on theory, would he be able to compete on equal terms with the “big-5” (Anand, Carlsen, Aronian, Kramnik, Topalov)? I don’t doubt he’d manage that even without doing any work. He’s still not at a chess age when you’ve lost your playing habits, and he’s got enough knowledge for the next couple of generations. Unlikely. People return when they really want to prove something. Kasparov, in my opinion, no longer has anything to prove in chess. vasa: Do you regret that you never managed to play Garry Kasparov? Such sentimentality isn’t in my character. I supported Anand, as I know him better as a person. Max-ML: You’ve got a very good score in personal encounters against the World Champion. Do you consider yourself an inconvenient opponent for him? Do you know how to play against him, his flaws? Is it a question of psychology, or simply playing strength? I’d like to believe it’s a question of playing strength, but more likely than not it’s a psychological issue for now. Thank you for the compliment. I think if I work properly and circumstances go my way then I’ve got chances. Vassily is one of the strongest contemporary chess players. I like playing him and I’ve learned a lot from him. It’s hard for me to characterise all of those players as I’m only closely acquainted with Kramnik and Karjakin. About Karjakin and Kramnik I can say that they both work a lot on chess and that given the right circumstances Sergey can develop to the level of Vladimir. There’s practically nowhere for Kramnik to develop further, except perhaps to reconquer the heights he’s already conquered before. Max2000: At one point in a KC-Conference there was a discussion about the calculating ability of Magnus Carlsen, and the opinion was expressed that to a large degree he’s a positional player, while tactics are his relative weak point. - You’ve played no shortage of games against the Norwegian. Do you think that in dynamic positions with complex calculation and tactics Magnus’ potential is comparable to that of such tacticians as Fischer, Kasparov, Aronian and Anand? Carlsen’s a universal player, like the majority of players in the modern elite. I don’t see any reason why he should be inferior to anyone in the aspects mentioned. - Would it be fair to say that the Sicilian Defence doesn’t entirely suit the Norwegian’s playing style? No, I don’t think it would be fair to say that. - How might a match between the contemporary Carlsen and Fischer of 1972 end if it was transferred to the present time? To be honest I don’t really like such questions… If it was also possible to transfer Fischer’s chair to the future then he’d have a clear edge. - And if in the match they ONLY played Sicilians for both colours (the Fischer-Sozin Attack, the Scheveningen, Najdorf and so on), and Fischer first had a couple of years to study the contemporary theory of that opening? It all depends who’d have Geller as a second, and who Polugaevsky. Kasparyan. I’ve always admired his studies. I remember my first encounter with Vaganian. I’ve got great respect for Rafael Artyomovich, and the game confirmed that. The interesting thing is that playing him again at a more mature age I almost displayed my respect again but the maestro, seeing that his team had already won, graciously gifted me half a point. One of my friends, for example Gabriel Sargissian or Levon Babujian. Armenia: What’s your opinion on World Champion Tigran Petrosian? Naturally, living in Armenia I couldn’t help but be under the influence of Petrosian. In my childhood I didn’t really like studying his game, but when I reached the level of International Master I was able to appreciate that deep and highly-original chess player. moroshir: What’s your opinion on the games of David Bronstein? Bronstein was a very original player, but I like his books on chess more. Serzh: Could you name your most “inconvenient” opponent, who’s apparently “weaker” than you, but who you never manage to beat, or who you only beat with great difficulty. Thank you for your replies. All the best! Zeppa: Does the problem of a difficult opponent exist for you, and which active player is one of those for you? The most difficult opponent for me was and is Tigran Pogosian, who works as a coach in Yerevan. That’s one of the reasons why if I drop into the chess club in Yerevan I hide away in the grandmasters’ room. Grafin: Which of the players in the top-20 has the “most iron hand”? Who do you personally find it most inconvenient to play? The most uncomfortable to play is Kramnik, as his opening preparation is much better than mine. Any player who, in my opinion, is capable of beating me. Don: Dear GM Aronian, thank you for all your creative efforts in chess which give joy and inspiration to those of us who enjoy the game in a far less than GM capacity. Good luck in the 2011 Candidates Tournament and I hope to see you as World Champion one day – before too many years pass! Seeing as by nature I’m an optimist and a self-confident person, I didn’t experience any psychological problems playing against elite players. Having won a couple of super tournaments and improved my play, I believed in myself – and even if I now have a negative score against many opponents I eagerly await playing them again. All the players who are younger than me and have grown up. I’ve also got plenty of sarcasm myself, so I take pleasure in talking with Vladimir and competing in sarcasm. Hikaru is irritating when he hits the clock very hard and, once in a while, for the way he behaves at the board, while I’ve got no complaints about anything else, and I don’t think my colleagues have either. I get on very well with Peter Leko and Boris Gelfand. It’s rare that I phone them, but I often think of them. If we’re talking about ratings: Anand, Topalov, Carlsen, Kramnik, Aronian. Some will fall out of that and then return. Possible people in that list: Ivanchuk, Grischuk, Nakamura, Gelfand, Karjakin. - What do you think about our chess team? Previously I didn’t understand how we were winning, while now I don’t understand how we’re not winning. I hope the upcoming team tournaments will bring us long-awaited success. - I know you work very closely with Gabriel Sargissian. Why is he lacking something to get the best results? Gabriel perhaps lacks some vitality. As a calm person he often wants to achieve victory without great complications. I’m sure that in the next couple of years, having made some small corrections to his play, he’ll manage to fulfil his potential. - What’s your opinion on GM Samvel Ter-Saakyan? Samvel’s very promising and I hope that in future his play will stabilise and he’ll be able to play for the team. - What’s your opinion on the young Armenian chess players? Which of them will play like you? We’ve got young players who have every chance of achieving success at the very highest level. It’s very interesting for me to watch the generation of players born in 1989. That’s Zaven Andriasian, Hrant Melkumyan, Avetik Grigoryan. Now’s their time, and I believe in them. - Sergei Movsesian has switched to the Armenian team. What’s your opinion on that? When a chess player who’s over 30 comes to a team the majority of people think that it’s strengthening the line-up by adding a sensible player who won’t burn bridges behind him. In our case it’s exactly the opposite. The team is solid in any case, and in fact it’s so solid that it’s rarely won anything recently. A player’s come to the team who can be the missing attacking unit of our team’s armoured body shell. Robert’s a very talented player. For now he’s searching for his style – which is natural, considering his age. He played very well at the Armenian Championship and I think taking part in training camps and then travelling with the team to tournaments will help him to progress. - Please can you characterise the leading Armenian chess players, and if possible, in some detail. Is there any hope that there are players on a firm path to becoming top-class chess players? So that my answer doesn’t become an article I’ll restrict myself to recent years and players in the current and recent national teams. I’ll begin with Sergei Movsesian. Sergei is a player with an active style, but he’s also capable of playing long gammon. By long gammon I mean the typical Caucasus style of play – the Reti Opening, closed Sicilians, Giuoco Pianissimo – i.e. going back and forth, conquering small points (in general, how does it differ from playing Civilisation?). He’s a typical representative of the Caucasus school of chess, which is distinguished by terrifying fighting spirit, natural talent, an absolute ignorance of theory, optimism and incurable laziness. Some (see the best representatives of the school) decided to combat that laziness, while others, like Sergei, have decided to make an effort once every couple of years. Having had a quick glance at the chessboard a couple of years ago he docked in 2750 rating waters, and then decided to go on vacation. Given that recently we’ve been working together I don’t think there’ll be long to wait for a second coming. Vladimir Akopian is also distinguished by many of the regional characteristics, but in addition he has talents like writing and performing guitar songs and composing brilliant studies and problems. He’s also got an absolutely brilliant memory, and his style is, of course, more positional. He usually studies chess during tournaments, sometimes teaching us by recalling blitz games he played many years ago. For example, the variation I played against Nakamura in Bursa in 2010 was shown to me by Volodya – who recalled a game of his from a junior championship where he had problems as Black. Gabriel Sargissian is my closest friend. Most of my successes and the successes of our team are down to him. He’s a subtle positional chess player who, as they say, the chess gods didn’t quite grant everything. When his physical condition is good his results can amaze people who don’t know his real strength. In the years I’ve analysed with Gabri I’ve learned a lot from him, and my opening knowledge in the majority of cases also comes from him. It’s interesting as well that Gabriel likes to study with young chess players, and such players as Arman Pashikian and Hrant Melkumyan have reached the level of solid players in large part thanks to studying with him. I know he can become a top-class player. Arman Pashikian and Tigran Petrosian are both players who could at any moment reinforce the team. They’ve got very different styles. Arman’s play is more fundamental and deeper, while Tigran is happy to enter boundless complications and also has wonderful sporting qualities. I also can’t fail to mention Karen Asrian. He was a very interesting chess player who soon achieved great success. And then left us too soon. We always remember him, particularly when playing in team tournaments. We remember the spirit of fun he created… That memory, that feeling he left us – that’s always with us, and with me personally. - Which of the top-3 Azerbaijan chess players (Teimour, Shakhriyar, Vugar) is the most dangerous opponent for you? The strongest Azerbaijan players have already formed a triumvirate for three years, and it’s hard to say which of the three is personally the most dangerous for me. I’ve had the most encounters with Radjabov, and our score is approximately equal. - Which chess team do you consider stronger – Azerbaijan’s or Armenia’s? I think the arrival of Movsesian makes the Armenian team a touch stronger. I see the biggest advantage as being on our strong fourth board. - What do you feel about GM Danny Gormally? I don’t know Danny very well. I hope he’s healthy and enjoying playing chess. - What, in your opinion, will happen with chess players in the distant future? Will the number of active players, grandmasters and rated chess players continue to increase? Despite the competition from computer games and other new forms of entertainment, I still think playing chess will be popular in the future as well. It’s like classical music. Humanity simply can’t come up with anything better. - Chess, it seems, is bucking the worldwide trend in sport. It was getting younger and younger, but now it’s aged dramatically. The World Champion and a good half of the elite are older players. Why? And what’s the optimum age for a chess player? That is, on average. From talking to more experienced colleagues I’ve got an approximate idea of that age. From 20 to 40 – experts say. It all depends on the personal qualities of the player. I think the presence of older players is yet more proof that chess has got little in common with sport. - Is it possible that in the near future chess at the top level will become only a game for the young i.e. you’ll have Wijk aan Zee with only young players of the age of, for example, the current Anish Giri or Magnus Carlsen. To what degree, in your opinion, is that possible? While knowledge of the opening, endgame and typical positions remains an important factor that’s not going to happen. Valchess: Please could you characterise the most promising young players – Karjakin, Caruana, Nakamura, Giri… Is there something specifically new and distinctive about this generation – or is it as it’s always been, they simply play chess well? It’s easier for the new generation to learn openings. The advance of computers and the appearance of databases with computer games makes it easier to find novelties. 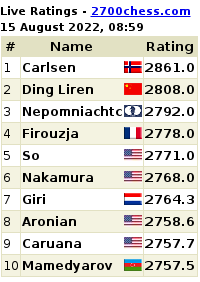 They all play very well, of course, but Carlsen and his natural gift is a different story. I’m not a great fan of playing with handicaps and for that reason I’ve never thought about it. If in the opening position a player with a rating of 2600 takes away his two central pawns against a player with a 2100 rating, then I don’t think he’ll have any chances of victory, but if you take the two outside pawns, then I think the stronger player will have an edge. It’s hard to find an exact balance when playing with a handicap. - Do you think a player at the 2150-level would be able to beat a player of your level with an extra piece? A player at Candidate Master level should logically win that no less than 95% of the time. Тактик: Is it true that all strong chess players have a complicated character (a phrase of Spassky’s)? A strong player having to spend a lot of time engaging in a mental struggle is something that gradually crosses over into his life. In chess you have to hide your emotions, be on your guard at all times so as not to be tricked, and try to be cunning yourself… Nevertheless, I consider the claim that strong chess players have a complicated character to be an exaggeration. We conduct ourselves quietly and don’t provoke anyone. It’s more that we’re a little odd and mysterious. "My dad and me on the Côte d'Azur during an excursion in the middle of the Amber Tournament." phisey: FIDE is always changing the rules for the World Championship. Does it take into account the opinion of top players in any way? Has a FIDE official ever turned to you with an official query? What happened in the current cycle reminds me of the story of a friend who lives in the former USSR. A couple of years ago he took part in a telephone company competition – “send text messages to this number and win a prize”. The competition went on for two months, and over the course of 40 days he’d endlessly send messages to the number at a cost of 10 units a message, and he found out that he was second on the list by some distance. Naturally, in a way that’s no surprise to any of us, during the last 10 days there was a campaign “send messages that cost 10 times less”, and my friend, realising what was going on, decided not to keep playing and accepted his defeat. Of course, fidgeting and endless changes are the weakest side of FIDE, but the thing is that players also haven’t got and haven’t had any initiatives or legal mechanisms to fight against it. There are many interesting and manageable suggestions from players, but there’s no-one to voice them and gather all the players together for a dialogue with FIDE. It’s difficult for elite chess players to spend time on that, and I think if in chess there was a “council of elders and lawyers” which would be selected by all the leading players and whose opinion the public and FIDE would take into account, then there’d be less conflicts and misunderstandings. But until then, while professionals remain in the role of people who are at times dissatisfied but simultaneously lack any sort of legal defence, and also realise that apart from FIDE no-one will offer then an income at the current moment in time, then everything will be decided without taking into account the opinion of professionals. Max-ML: What’s your opinion on the Candidates Matches? Would you, like Carlsen, like to see the World Championship held according to a different formula? I think the Candidates Matches are a good format if the whole system, including the Grand Prix and the World Cup, is preserved. I’d really like to see this system remain, and for us finally to have a stable and clear selection system for the World Championship match. In general, after changing the system many times, we’ve finally come to a more or less logical structure. Among the players who took part in this cycle almost all of the strongest had a chance to get into the Candidates Tournament. The person who’s fairly passed through such a tough selection process will be entirely capable of putting up a fight against the World Champion. Any championship cycle is part of history, and unless it involves a group of the strongest players it can’t be taken seriously. This cycle has gathered together perhaps not the most ideal line-up, but one in which the majority of the best players are nevertheless taking part. - How do you evaluate the outcome of the FIDE Presidential Election? Who did you support – Ilyumzhinov or Karpov? Having consulted with my more experienced and wiser colleagues, I decided to spend these elections in the role of an outside observer. Of course, the fact that the elected president’s team still contains people who don’t have a clean reputation in the chess world can’t be anything but frustrating. - Do you consider the current system for deciding the World Championship title to be optimal? Fans have already lost count of FIDE’s experiments. Which system, in your view, should be in place? Should the World Cup be included as part of the cycle? How should the challenger be decided – in matches or a tournament? How long should the cycle last – 2 or 3 years? Lezheboka: Which system for deciding the World Championship title do you consider the fairest? What do you think the selection system should look like? It’ll be optimal when we know what we’re going to do for the next 10 years. Without long term obligations and contracts there’s no way of avoiding the chaos we have now. There are various options for the system. Personally, I like the system with the Grand Prix and Candidates Matches. vasa: What’s your opinion on the stance adopted by Carlsen, who refused to take part in the Candidates Matches? Perhaps he’s afraid of having to meet you again – and losing? I can try to explain and analyse the moves of Carlsen the chess player, but the actions of Carlsen the man are difficult for me to comment on. I hope, nevertheless, that it isn’t a question of his being dissatisfied with the Champion having privileges. I think the opinion he voiced runs counter to the traditions of chess. - Should the Champion have privileges? If yes, then which? It seems to me that the current state of affairs is more or less appropriate. - Would you reintroduce 24-game matches? No, that’s against the spirit of the times. 12-16 games are enough to reveal the strongest player at that moment. Vaibhav: All the best for the coming Candidates. It will be great if you become the challenger as you are the only worthy and willing person who hasn’t had a chance yet. We see that many super tournaments are either delayed or cancelled, which I believe is the result of a lack of sponsorship. The majority of super grandmasters are communicative and pleasant people. It’s in large part thanks to the cooperation between the best players and organisers, sponsors and the press that new tournaments appear. The fact that some tournaments are temporarily suspended is linked more to the general world financial situation. As experience shows, active federations usually achieve success in popularising our game. The main thing is that the people working in the federation are real chess enthusiasts. It’s hard to demand anything of fans. They’re already a rare breed of people who value our work and respect our choice in life. People respect chess, and I think they respect us more than other representatives of the world of intellectual games. In countries where chess is popular many companies are seeking cooperation with chess players. We can offer our game, an acquaintance with which is, I’m convinced, useful for any thinking person. I grew up as a chess player in the Bundesliga. While playing for Wattenscheid I gained many friends and learned a lot from my colleagues. Switching, as a strong chess player, to Kreuzberg, I already wanted more than simply to take part without any hope of winning the championship. Currently I wouldn’t be against playing in any league, but I want to fight for the top places. I like playing in Linares. It’s warm there, and in general I love Spain. If it’s a question of the best organisation, then it’s hard to compete with Amber, which, unfortunately, isn’t going to be run anymore. - At which of the traditional super tournaments – Moscow, Linares, Wijk, Dortmund – do you find it most pleasant (comfortable) to play? And, on the contrary, where are you least comfortable? Linares and Wijk are very pleasant and well-run tournaments. The tournament in Moscow has wonderful organisation but, like many people from the Caucasus, I don’t particularly like being in Moscow. - Which would you choose for the format of a super tournament: playing on a stage in front of a huge hall with a varied audience, or in an isolated room without cameras or a broadcast? I really like halls and a large audience. You feel as though you’re a real artist. Of course, if they decided to zero the ratings, as in tennis, then the figures would be fairer. With the current system someone can choose not to play for a couple of years and still keep his rating. We even had a couple of years in Armenia where a player managed to get into the team on rating by playing a tournament a year. But overall, ratings do show the state of affairs at the current moment. phisey: Is there Elo rating inflation nowadays? There is, and it’s easy to spot – particularly for someone who plays the game. My approximate feeling is 50-60 points every 10 years. The general level of chess players is improving, there are more of them, and the moment a couple of players relax and donate their ratings to society, the rating level rises. I’m not competent in this area, so that’s just my personal impression. Of course not, as the gap between him and the chasing pack was very significant, and in that sense his rating is unattainable. CAL|Daniel: Thanks for your time! Good luck in the Candidates Matches! I’ve already replied about ratings. Draws aren’t a bad thing, but they should arise as a result of a full-blooded struggle. Very often professionals find an excuse for a lack of fighting spirit in the form of “the position that was too dry and further play would lead to exchanges”. As experience of playing according to the Corsican/Sofia Rules shows, very often the player who wants to bring the game to a draw makes concessions and compromises his position. I think the ban on offering draws should be introduced into all major tournaments and matches. On the question of playing on in dead-drawn positions – you have to hope for the understanding of the arbiters. Stability of play and workload. - Has the management of the Armenian team analysed the results of the last Olympiad? Of course we analysed the results. There’s potential for improvement. I’m confident the help we get from the country’s leadership should also inspire the young chess players. My impression is that we’ll win gold in the upcoming team tournaments. - Is Sergei Movsesian’s change of chess citizenship an independent event or a result of such analysis? We already wanted to bring Sergei back into the team after the Turin Olympiad, but it’s understandable that Sergei didn’t want to switch to a team that had just won gold and take the place of one of the Olympic Champions. Having made the same mistake in Dresden, we got a bit wiser in the last two years and started to think about it. Thanks to the results of the team in the last 2-3 years we were able to execute the planned improvement to the team. - Have you pre-arranged draws? I don’t recall offering a draw without any play myself, but I confess to having agreed to some. - What’s your view on that, and do you think it’s acceptable in some situations? It’s absolutely unacceptable, but it’s hard to fight against. Given that draws without play are offered by people who are far from the worst at this game, you need to think up some sort of effective means of preventing it. You can often see whether people go for a 3-fold repetition based on play, or if it’s a pre-planned operation. The difficulty is that players sometimes go for drawing lines without agreeing beforehand. Although pre-arranged draws are a problem, it strikes me that the problem is much less significant than that of throwing games. I’ve never suspected anyone of using computer help, but I’ve come across unfair play from an ethical point of view during a tournament, and that’s a great evil for chess. Геннадий Иркутск: Hello, Levon Grigorievich! - What, in your opinion, is the best way of popularising chess? Charming and strong chess players holding exhibitions, lectures and meetings with fans and children. Active promotion by professionals can create interest even in places where chess isn’t popular. John Witty: Thank you in advance for your answers! I congratulate you on this because it’s a very good PR effort by chess players and the media. I think that chess might be more popular if the players did more PR and refrained from being only geniuses finding the best play like a machine. That’s a problem I’ve often talked about with my colleagues. Unfortunately, the desire to popularise chess always brings people to the idea of getting it on television, but I think the majority of chess fans use the internet to follow tournaments, so it would be appropriate to create an online chess resource to discuss chess players and chess. Personally, I’d be glad to get involved in such an enterprise. phisey: Levon, do you have a recipe for popularising chess? How can we see our sport in greater demand in the modern world? How can we get it out of our narrow world of devotees and make it accessible to the wider masses? Perhaps it’s time to change something in the rules of the game – for example, as in many team sports which constantly introduce changes to be more competitive when it comes to fighting for viewers? True, it’s only us, chess players, who have a fashion for fighting to maintain the classical time controls, classical chess and so on. In hockey there somehow weren’t any experts who fought for classical hockey, in which it was possible to gently squeeze the puck to the side and oblige the referee to blow his whistle immediately. Or in football it was amazingly easy to introduce a tightening of the rules in order to speed up play (the goalkeeper can’t hold the ball in his hands for more than 6 seconds, if an out-field player passes the ball back to his keeper then the latter can’t pick up the ball in his hands, and so on.) Perhaps it’s time for us chess players to keep pace with the times? We are keeping pace with the times, and anti-draw rules are an example of that. It’s simply that changes to the game itself, like, for example, the football points system or a significantly accelerated time control, defy logic. Personally, I really like Chess960, but it’s still too early to introduce such major changes into the game. The suggestion of choosing 5-10 Chess960 positions and using them in super tournaments, but leaving things as they are in normal tournaments – is a good one. The main thing is that all professionals approve of the idea. Maldini: Hello, Levon. Congratulations on your recent successes and I hope they continue! I really like simultaneous displays. I usually try to conduct them at full strength. - How do you assess your match against Grischuk? My preparation, it seems to me, hit the mark – in general I was satisfied with the positions I got, except perhaps in the last game, where I was simply downcast that I hadn’t won the penultimate one. Overall, I was applying pressure for almost the whole match. Of course, I failed to take an excellent chance in the first game, but it often happens that the first round goes badly for me. As it was, Sasha played and defended very well, not giving in – and in the rapid games he deserved to emerge the winner of that short match. There’s essentially nothing else I can say. - What do you think about the winner, Gelfand? I think Boris deserved this win. He’s a man who treats chess with great reverence, and who works a lot… and is very, you might say, patient with it. You know, it’s easy to work when you can see an immediate return, but he’s had difficult periods, and still to believe in yourself and try to keep working despite that… I’m very, very glad for him, that his dedication and love for the game has borne fruit. This success shows that there’s chess longevity in his blood! Well yes, you can agree with him on some points… But it’s also true that there were boring draws, and it’s not a question of the openings but that over such a short distance everyone was trying to play very solidly. I treat draws as such normally, as part of the game. But draws without a fight, particularly when some players offered them at a very early stage of the game – that, it seems to me, is bad for the game. It also depends, however, on how you view chess. If you view it as work, as sport – then it’s perfectly normal. But it’s not so good from a creative point of view, or overall, for the image of the game. - So maybe the format with very short matches is the problem? What do you think, should it be left in place for the next cycle, or is it worth changing? In principle, the format could be left unchanged, but with two fundamental modifications. Firstly, it would be worth increasing the length of the matches to 6 games so as to at least slightly reduce the cost of a mistake in one game, and secondly – introducing anti-draw rules. Experience shows that in events where it’s forbidden to offer draws, particularly in the early stages of games, that same striving for solidity isn’t manifested so clearly. Even if a player wants to make a draw – he has to make it at the board, and people begin to think, or sometimes to get nervous… And the games end up interesting!